In this post, we are going to see how weight loss and the mind conditioning of a person is related and the role of our subconscious beliefs in deciding our body shape. Earlier people would have never accepted the idea that a person’s body weight could be a result of the ideas ingrained in his subconscious mind, but now it is becoming more and more evident that weight loss has a lot to do with a person’s mind and his relationship with food. For some people it would be very difficult to accept that “weight loss is all in the mind” however, we know it very well that even stringent diet plans and rigorous exercises have failed to work for thousands of people, and many of those who have succeeded would find themselves gaining the weight back within a few months..Why?-It is all about the self-image which is what we are now going to discuss next. Apart from genetic features it is said that everything about our body is a reflection of the ideas present in our subconscious mind just like the way the operating system on our computers are the result of some set of programming codes. These “ideas” I am talking about is something which our mind has imbibed from the environment in which it got developed. So, the internal as well as the external conditions of our body is a direct result of the information received by our mind during childhood from people and events. “Self Image” is what runs the whole show. Self-image is a set of ideas in your subconscious mind that describes “who you are”, in other words it is how you see yourself. When it comes to the subconscious mind’s mechanism, it is not that easy to know it on a conscious level about what is going on inside and often its working seems so insensible like a kid’s activities that we can’t understand it using our logical mind. For example, one day when was going through a session from Christie’s Unlimited Abundance Course I came to know about one of my subconscious beliefs resulted from an incident that occurred in my childhood, which was one of the reasons for my current body shape- In school, I was tortured by a bully, he was fat and round so, my subconscious mind accepted the idea that being fat is necessary for self defense. Like a thermostat, self image of a person works to bring his body back to the previous state once he does something to change his outside appearance. So if you are willing to follow a diet plan or joining a gym, then first work on your self-image before you take actions. It is a very complex phenomenon that has shaped specific aspects of your self-image but the good news is you can change it without taking the trouble to know it. Affirmations, creative visualization, energy clearing, etc are all ways using which you can alter your mind programming. Read my post “Allow your abundance” to know a few ways that will help you to change your subconscious beliefs. One of the simplest and most effective ways to lose body weight is to improve your eating habits and to build a good relationship with food. We all don’t always eat food to satisfy hunger and those who are struggling to lose weight have totally forgotten the true hunger because they feed themselves for other reasons than body’s need. What I am talking here is about emotional eating, which is the habit of seeking pleasure through food or eating due to psychological reasons. This too is related to the mind conditioning of a person that makes him to believe that food brings joy. If you find yourself eating even after you are full, eating at night after dinner, having a sudden uncontrollable urge to eat, craving for sweets, eating absentmindedly etc then it might be the right time to make a few changes in your lifestyle. 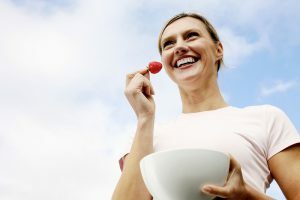 One of the best ways to improve one’s relationship with food is “Mindfulness Eating” because all the unhealthy eating habits are born out of a person’s inattentiveness while eating. By learning to enjoy eating food with complete presence focusing on the sensations like smell/taste of the food you can avoid the food cravings and you will also be able to distinguish between the emotional hunger and the true one. You may also find something useful in my post on dealing with false hunger.